Home Situation: Live in a 2,500-square-foot townhouse with my husband (52, BigLaw partner) our kids (son, 10, with ADD and dyslexia; daughter, 7; son, 4; and son, 20 months), and our au pair. The three boys share a room. Childcare Situation: Au pair plus a part-time sitter for a total of 61 hours per week. $460 per week in stipend and pay, plus about $9,000 in au pair fees and about $10,000 for nursery school for the two little guys. Stock photo via Shutterstock / pathdoc. 7:30 a.m. I get up. My husband and I have a deal that on the weekends he gets up early with the baby and I sleep in, then he gets a nap in the afternoon. I have coffee and get kids’ clothes ready for church. I am on call for our answering service and I get a call for a prescription refill. 8:15 a.m. I get in the shower and start the LONG process of getting four kids ready to go to church. My husband is unpacking our grocery delivery (it comes between 5:00–6:00 a.m. on Sundays and is left on our front porch), cleaning up the kitchen, and helping corral kids. 9:40 a.m. We finally get out the door. I am teaching church school this week (I do this 6–8 weekends per year) — this is during the service (10:00–11:00 a.m.). This means when I don’t teach church school I can sit in church and actually pay attention, so it’s worth the time to teach. We spend a few minutes socializing at coffee hour. 11:30 a.m. Back at home, anyone who didn’t eat too much coffee cake has lunch. I eat something and change. 12:15 p.m. I head out the door for a run. While I am gone, my husband will put the baby down for a nap and take a nap himself. The big kids will play on their own in the basement. 1:15 p.m. I get back and sit down to do some work for a few hours. 2:15 p.m. My husband takes the 10-year-old to his soccer game. I play with the middle two kids and read a bit. 5:00 p.m. We all get ready to meet friends out for a family dinner. 7:30 p.m. We get home from dinner and start the bedtime routine. I put out clothes for the kids for the morning and read to my older two kids, while my husband reads to the little boys. 7:45 p.m. The little boys are in bed. 8:30 p.m. It is lights out for the big kids. I get the laundry ready to go out. My husband and I send out most of our laundry, and what can’t be sent out (delicates, largely) is done by our housekeeper on Tuesdays. Our part-time sitter does the kids’ laundry with some support from our au pair. I select my clothes for the next day, get ready for bed, and read. 5:00 a.m. I get up, shower, and dress. 6:00 a.m. I leave with a huge travel mug of coffee. 7:00 a.m. I start seeing patients at 7:00 three days a week, and patients LOVE this. This also means I am home after school three days a week. My husband is responsible for mornings, including getting the kids dressed and fed and lunches made. 7:30 a.m. Our part-time sitter arrives. The big kids walk to school either together or with my husband on his way to the train. The big kids are gone from 8:15 a.m.–3:00 p.m. on school days. The 4-year-old goes to school from 8:45–11:15 daily, and the baby goes to play group twice per week in the mornings with our au pair. Our part-time sitter also does all the children’s laundry/ironing and helps keep the house sorted. 11:30 a.m. The part-time sitter hands off to the au pair. 12:00 or 12:30 p.m. I get back to the kitchen and chat with staff and eat something in between patients. I also return phone calls, call in refills, and deal with paperwork in odd moments between patients each day. 5:30 p.m. I see patients until 5:00 p.m. on Mondays. I get in the car and drive straight to pick up my 10-year-old and his friend at soccer practice. 7:00 p.m. We get home. The au pair has fed the other kids dinner. My husband and I again tackle the bedtime routine. Mondays are always tough because the housekeeper comes Tuesdays and the kids are responsible for cleaning up the basement playroom so she can vacuum. The au pair is off duty now. 8:30 p.m. We sit and eat dinner, and the au pair joins us. Then I change, put out my clothes, and read a bit. This is our first year with an au pair. She arrived in July, but it was something we had been thinking about for awhile. We had always had nannies from the time my 10-year-old was born. Given my husband’s schedule and mine, daycare was unlikely to work for us. However, we found nanny care to be exceedingly expensive in the tri-state area. Additionally, even nanny care was not as flexible as we would have liked. … The benefits of the au pair for us are cost (about 1/2 the cost of a nanny), level of education (our au pair has much more education than our nannies did), flexibility (including the need to adjust the calendar on even a weekly basis), and turnover — unlike with a nanny, you are required to reassess your childcare needs on an annual basis, which is I think is helpful. We absolutely love our au pair and will miss her when she leaves in July. But we have already identified our next au pair and cannot wait to welcome her. 5:30 a.m. I get up, shower, and dress. 6:30 a.m. I leave for work. My husband will do the usual morning routine. Our au pair starts at 7:30. 9:00 a.m. The housekeeper comes after all the kids are out of the house. She is amazing and has worked for us for more than 15 years. She does a deep cleaning weekly, washes all the linens, irons my sheets (her idea, not mine), and remembers to polish the serving pieces for the holidays, etc. 7:30 a.m. I arrive at work. (My commute takes longer when I leave later.) I do some paperwork, then run to the hospital for Grand Rounds from 8:00–9:00. I see patients from 9:00–3:00. 3:30 p.m. I try to be in the car by now. Traffic is awful coming home and I get there just in time to pick up my 10-year-old and take him to the dentist to have his palate expander assessed — no more turning!!! Yippee! As the medical parent, a lot of these “medical” responsibilities fall to me. 5:30 p.m. We get home and the au pair is off duty, but she mercifully stays to help with the baby while I make dinner. 6:45 p.m. We eat when my husband gets home. 7:30 p.m. We head upstairs and the au pair cleans up the kitchen (out of the kindness of her heart — she is amazingly helpful). We get the kids to bed. 10:00 p.m. I get home and don’t get to sleep until after 11:00. 6:00 a.m. I leave for work. Today’s vat of coffee makes Monday’s look like child’s play. 7:00 a.m.–1:00 p.m. I do some paperwork and see patients. Wednesdays are always my busiest days in the office. 2:00 p.m. I get home and gobble down some lunch (leftovers) while the au pair gets my daughter at school. (They get out at 2:00 on Wednesdays.) The baby is napping. Then the au pair runs to get my 4-year-old from “soccer.” As she walks in, my daughter and I leave for her violin lesson. The lesson is 2:45–3:15 and is five minutes from our house. I read in the hallway outside her lesson and go in for the last five minutes to hear her progress. 3:25 p.m. We arrive home. I make coffee and head back out to take the 10-year-old to therapy at 3:45. His session is from 4:00–4:45 and it is a necessity! I read in the waiting room. 5:00 p.m. We arrive home, and his reading tutor has beat us there. He is with the reading tutor from 5:00–6:00 (another necessity — he gets extra reading help at school too, but the private tutor has made the biggest difference!). During this time, the au pair bathes the other three kids and I return work emails and make dinner. After the tutor leaves, he showers. 6:45 p.m. We sit down to dinner when my husband gets home. 8:30 p.m. When everyone is in bed, I sit down and work for an hour or so and watch some TV with my husband at the same time. I then doze while he watches more TV. Right now, we are in a really good place with support in and out of school and with a medication regimen that is working. A year ago we were not, and that meant constant phone calls and meetings to try to get his needs met. I did feel like he was getting the lion’s share of the attention and my 4-year-old (then 3.5 years) was especially suffering. It was at the time that I instituted Starbucks dates with the 4-year-old. The first time we went, I bought him a Horizon milk and he started talking loudly about how much he LOVED the milk and how GOOD it was. It broke my heart a little that he was so excited to get a milk in Starbucks just to spend some time with me. 6:30 a.m. (!!!) I get up, get baby up, and head downstairs. Coffee. 7:30 a.m. Sitter arrives and husband leaves. 8:15 a.m. Get big kids out the door. Pack my bag and leave with the 4-year-old at 8:25. We walk to his school, which takes about 10 minutes. We chat about some construction taking place on our way. He plays with friends outside and I chat with other moms. Doors open at 8:45. I drop him in his classroom and walk with another mom to get a cup of coffee and walk to the train station. 9:07 a.m. I take the train into the city. I read. I get on the subway and then get off a stop early. I walk to the bank and to a gourmet grocery where we like the pasta sauce, and get sauce for dinner. 10:15 a.m. I get to my desk. I have a meeting about a new medication. 11:00 a.m.–5:30 p.m. I see patients. 5:40 p.m. I leave to take the 5:58 train home. 6:40 p.m. I walk from the train station and arrive home with my husband. I throw together a quick pasta dinner while my husband gets the kids to set the table. 6:50 p.m. We sit down to eat. 7:30 p.m. We head up for bedtime. 5:00 a.m. Up at 5:00 for last time this week. Shower and dress. 6:00 a.m. Out the door. 6:25 a.m. At my desk. Chat with the junior partner about the practice issues — we meet informally every Friday morning. 7:00 a.m.–12:00 p.m. See patients. I return emails and calls and prepare for the weekend. 2:15 p.m. I leave with my 4-year-old for our weekly Starbucks date. He gets a cookie and I get a latte. He is the third child and doesn’t have many activities yet. As a result he misses out on 1:1 time. This is our protected time, just the two of us. 2:40 p.m. We walk to school and pick up my daughter. 3:00 p.m. We arrive home and I sort backpacks and sign math and spelling tests. I do 40 minutes of yoga using the Down Dog App. 5:00 p.m. I get home and return pages and emails. Au pair leaves with baby to pick up my daughter. (Au pair is a saint!) I open a bottle of wine and make dinner. 6:15 p.m. My husband gets home and au pair, daughter, and baby get home at 6:45 and we sit down for dinner. 8:00 p.m. We start the bedtime process. 8:30 p.m. Everyone is in bed, and au pair has cleaned up the kitchen. Husband and I finish our wine. 9:30 p.m. I am in bed, and asleep not long after. Much of what I do [as a doctor] is help people to lose weight. I feel I need to start by leading by example. My goal is to do something 6 days per week — 3–4 longer workouts and 2–3 “better-than-nothing” workouts, which might be parking my car further from the office or doing the New York Times‘ 7-minute workout. 6:45 a.m. Wake up, get a cup of coffee, and get changed. 7:05 a.m. My friend arrives to run. We run for 45 minutes and then grab coffee and head home by 8:00. 11:45 a.m. Make lunch and eat. 12:30 p.m. The baby and my husband are napping. The big kids are watching Indiana Jones and I am reading. 4:00 p.m. Snack time for the kids and coffee time for me. Hang out with the kids. 5:45 p.m. I start dinner for the kids and change to go out. 7:00 p.m. We walk to PTA fundraiser cocktails (with a great local taco place catering). Chat with friends, have a drink or two, eat tacos. 10:00 p.m. Get home, and in bed by 11:00. Thanks so much to Reader G for sharing a bit of her life as a working mom! 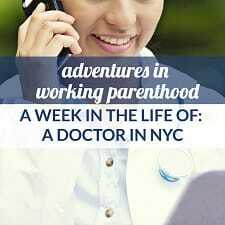 Readers, what’s your biggest takeaway from her week of work as a private practice physician, as well as her general work/life balance? I got to Monday and was already exhausted. I’m so impressed with your level of organization and balance. I often wonder how dual-high-powered careers make it work, and this is the answer – with a ton of help and partnership. I liked hearing how everyone pitches in and gives 100% and that all adds up to a great experience for each kid. My hat is off to you, G.
ditto. im impressed. i have two and excercise does not happen other than at my desk. +2. I am similarly exhausted from reading this and impressed. I thought I was organized but wow! Thank you! Organization is key. My husband and I have regular calendar meetings. We are having 1 tonight. It helps us to be sure everyone is getting to do some/most of what they want to do (including us!) and to make sure everyone has what they need. I recently read “Drop the Ball” by Tiffany Dufu and all I could think was “I dropped the ball way back in Med school!” We do also have a ton of support, which is critical. What year of medical school/residency/PGY were you when your first was born? Any advice for aspiring female doctors who want to be moms? I had my 10 yo in 3rd year of med school, 7 yo in IM residency, my 4 yo in Endocrine fellowship and my 2 yo as an attending. This is really interesting, thank you. I’m sending both this big post and your blog post to my sister, a mid-20s, about-to-start-residency, married woman who wants to have kids! Yes, all I could think of was WOW when reading this. 4 kids + both parents with busy jobs + lots of schedules to keep track of. It seems like every day’s schedule is different from the others – did you find that to be the case once your oldest kids started to get older or have your days always been like this? We just have a toddler now and, for the most, M-F look pretty much the same and weekends have a general pattern to them too. I wonder if that will change when we have more than 1 and when they’re a little older with more activities. I had my children during medical school, residency and fellowship (see above). So over the years my schedule has changed a lot. 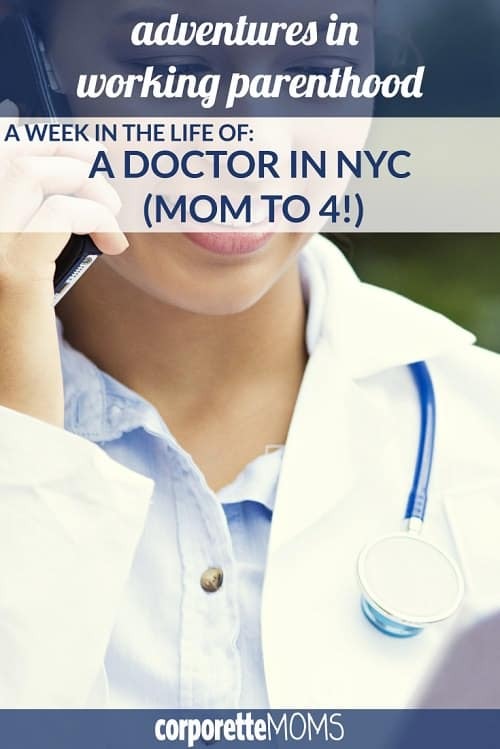 I took my current job in a private specialty practice because I could make my own schedule. This allows me to be home shortly after school gets out (or sometimes before) 3 days per week. With older children I have found this to be super helpful. I see patients 34 hours per week and then do all my admin between patients or at home. Each day of the week is different, but each week is the same so we have a rhythm that we get into. Also be selective about what activities you chose for your kids. My older kids each do 2 activities. That is enough! I’m jealous of all the walking that city life provides. When we left NYC (when our oldest was approaching nursery school age and we couldn’t stomach the cost or the application process) we were particularly looking for a short commute and a house in walkable distance from the train. We quickly honed in on our town and it was there or bust. We live in a smaller house so that we have a shorter commute and more walkability. It is the right trade-off for us. This one was an amazing aspirational read for me. Most of the way I was like, oh I could make this work! But I definitely need more than 7 hours of sleep a night… I’m sadly more like 8 minimum 9 optimally. Does this mean I will never workout again? Don’t answer that! G, hats off to you! I have tracked my time over several weeks in the last 2 years. No matter what is going on in those weeks I average 7.4 hours of sleep per night. I certainly aim to be in bed 7-8 hours before I have to get up. If I sleep less during the week I might nap for an hour or so while the 2 yo is napping. The other 3 tend to be able to not burn the house down. I have found that tracking my time has really allowed me to figure out how to do all the things I want to do including exercise and reading. This is super helpful. I have three and I’m challenged with giving each enough individual time -love the Starbucks dates idea. I noticed that your husband napped while the older kids were home? At what age did you start feeling comfortable with that? Definitely an option I hadn’t thought of. I find that I do better with individual time with each kid if I am intentional about it–it goes in the calendar like anything else. So does working out. When our oldest was born we all used to nap/read at the same time. When our oldest kiddo stopped napping (that feels like ancient history) we instituted “quiet time” when he would watch a movie/show while I would read and hubby would nap. We still expect quiet play from the non-napping kiddos on weekend afternoons for an hour or 2. My 10 yo often reads during the time and I my 7 and 4 yos play independently. I think my oldest was 6 before I would leave when my husband was napping and I won’t leave if the 2 yo is awake. The big kids know Dad is there if they need him, but they should be playing quietly. Knock wood we have never had a problem. That was a really great read, thanks for sharing. I really appreciate your thoughts on the individual/intentional time with kids. And I agree with the organization comments above, I have no idea how I would manage. I’m curious about the off-duty time for your au pair when she helps out to be nice – how does that work with her hour restrictions? I guess I’m wondering how people determine volunteering versus official time, because it seems like something that could be prone to abuse by employers. I hope that doesn’t sound like I think you’re abusing it at all, I’m just wondering how it works – kind of like how employees at non-profits aren’t allowed to “volunteer” for the same type of work they are paid for, along with their other restrictions. Not OP but I also have an au pair. They are members of the family and not just childcare workers, so it is reasonable to expect them to do some help around the house (like cleaning up after themselves or helping clean up the kitchen after they participated in dinner). That’s different than making “scrub the kitchen floor” one of their assigned tasks, which you can’t do. When my AP comes as a guest to my son’s birthday party this weekend, it won’t count as working hours, she is just coming to celebrate with us. It is a little complicated sometimes, but I make it clear what are working hours and what are not, and anything that’s not a working time is just her being a helpful human being who is a member of the family. As above, she has a schedule written down. If she is not working she can hang out with us or not (eat dinner etc.). However, I feel that if I prepare dinner and she eats it it is not unreasonable for her to help with kitchen clean up. I would expect that of any adult living in my house. I would NEVER expect her to do the dinner dishes if she was not working and did not participate in the meal. It can get dicey. Our Au pair does go above and beyond at times. We will thank her with gifts (experiences she is interested in on vacation or a scarf she has had her eye on). These are not pay for extra work but tokens of appreciation for her extra effort. When our au pair takes my daughter to French she is working, but I am home and she could leave the 2 yo at home. It helps me immensely when she takes him. These aren’t extra hours worked but extra effort that is super impactful for me. My husband and I often talk about what having extra $$ would do to making our lives feel more manageable. We only have one, but with two full-time, stressful jobs, volunteering, homeownership, and active social lives, we feel stretched thin all the time. Thanks for being so upfront about all of the extra help you have — it’s provided good fodder for what we might think about doing if/when we have more $ in the future. Can I ask about your husband’s hours? It seems like he’s working more of a 40-50 hour per week schedule based on his availability, but maybe he’s working more after kiddos go to sleep or early in the morning. Have they changed over time? Oh, if you have a two career household and more than 1 child you need an arsenal of help! We have 61 hours of child care and a weekly house keep and 2 kids in elementary school. There are not enough hours in the day to do it all without outsourcing. As for mu husband, he is several years my senior and is a partner so he has some ability to control his time. He probably really works 50-60 hours per week on average with a BIG spread. HE will often come home for dinner and work from 8-11:30 or 12 at home. He often has work on weekends that he does early or late. He travels and goes to the printer. One of the things that having an au pair allows us is that if he is out of town and I am leaving for work at 6am, she can work for 1.5 hours until the parttime sitter arrives. The Au pair has really been revolutionary! And she is more affordable. I would also be really remiss if I didn’t mention that I was in medical school and residency during the financial downturn. Serendipitously (or not), he was underemployed when I was working my most brutal hours. As I finishing residency the economy picked up and he got busier again. There was obviously no plan for this and financial it was difficult but as a way to seal with a time shortage it was great. Also, please note for a physician and a Big Law partner we live in a modest home. This is because we chose to live closer to our jobs in a desirable school district. Less house, but less commute and a true village of support! +1 to this! In the same boat as you with two children and having the extra money to afford an au pair and more household help would make a WORLD of difference in our two demanding career household. We feel stretched thin all the time. Wow. I love how you can structure your days so you have time for both pick up and drop off some days. Thanks for also being transparent about the household help, I don’t know how you would do it otherwise! Husband is now an attending and we chose to buy < a mile from the hospital that we both work at (and the rest of our everyday life is all within a mile too including church, schools, activities including piano lessons, 2yo music classes, gymnastics, ice skating, & dance class… the only exception is our boys' sports which are still within a 15 min drive). My husband was hesitant about the au pair, but in the end, it has been such a life-changer. Anyhow, thanks for sharing! It gets better every step of the way! I felt like each year of training things were more manageable than the year before. Hang in there! If you don’t mind sharing … was 4 always the plan, or did you have a kid, wait a couple years, then say “sure, we could add another”? What do your vacations look like? Do you fly with the entire clan, or stick to places you can drive to? And does the Au Pair come with? +1, would love to hear this info! We always wanted a large family. I have 32 first cousins and have always liked the hubbub that comes with large families. Our children are all 2.5-3 years apart, which I have liked. Recently we have been doing a lot of traveling to see family and we do take the whole crew including the au pair. Prior to having #4 we did two trips to Europe and my mother came with us for those. We are gearing up for another Europe trip, but have not decided how that will look. We just returned from a trip to AZ and we all got the flu within a week of returning, so I am not really feeling like jumping on a plane again super soon. We have toyed with the idea of travel with 1-2 kids, but we haven’t pulled the trigger on this yet. 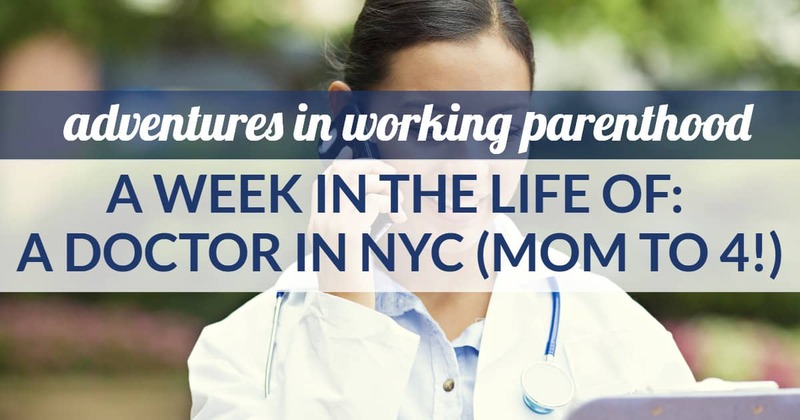 I love the “Week in a Life of a Working Mom” series so much! I’m a new working mom myself and all of these are so helpful. It’s great to read about the different childcare arrangements and household services. 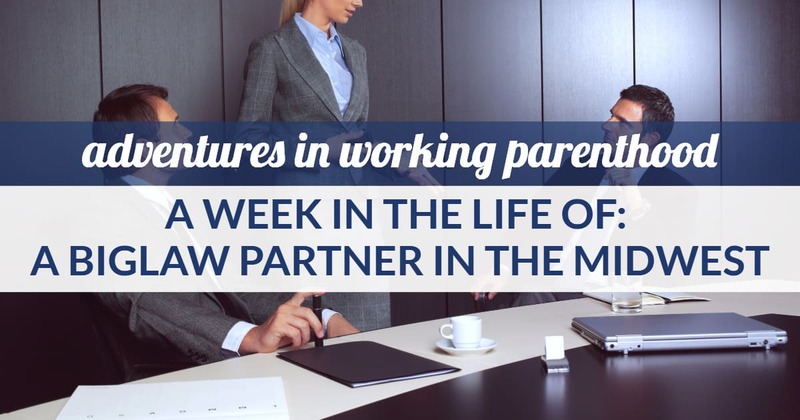 As well as learning about different working Moms with different kinds of careers, hours, and commutes. It really makes me feel apart of a community, as corny as that sounds. There’s great tips too–I didn’t know about DIY dry cleaning before! Thank you so much “Doctor in NYC” for sharing!!! I have thought about blogging. I have done some writing. I linked to a piece I wrote recently about having children during medical training. I have some other ideas in the works. Can you share the amount of time spent helping the older kids with homework and who is the one helping them? Where do you fit homework time in? My two oldest are in first and third grade and I still have to help them with homework (which means I have to leave the office earlier). I have two of 4 children doing homework at this time. My 4th grader is very conscientious about homework. He has a routine and sticks with it. This has improved significantly with getting him on a medications regimen for his ADD which works well for him. He takes about 30 minutes when he gets home to unwind and have a snack. Then he sits and does his homework unaided. He reads independently for 30 minutes daily as part of his homework as well. He requires a little more help for longterm projects, mostly in planning how he will execute the project. My daughter, who is neurotypical, and is in 2nd grade requires much more handholding. My au pair and I both help her with homework at times. She has about 20 minutes of homework per day and then she reads to me for 15-20 minutes daily. I prefer my children to be as independent with homework as possible. As I explain to them I have long since passed the 2nd and 4th grade and their teachers don’t care if I can do their math worksheet. If they cannot complete homework in a timely manner they will suffer the natural consequences of this including telling their teacher why homework is not complete and having less play time because they didn’t complete their work in an efficient manner. My daughter also practices violin daily (which the au pair typically supervises) and she has French homework which I supervise since I am the only French speaker in the house (although our next au pair speaks French as well as Spanish and English). im interested to know about how you calendar all of this — do you use an app or just a regular gmail calendar or something? does each kid have her own calendar that you coordinate? We use the Cozi app. Everything goes in there including au pair activities, after school schedules, meal planning etc. I review and print the schedule on Sunday and post it on the refrigerator. However, all the adults have access to it on their phones, tablets, laptops and desktops. I keep it open on my computer at work incase I need to check anything during the day. It also updates in real time so if I schedule something, my husband and au pair can see it right away. Thanks Doctor in NYC for sharing. I really admire how you have made this all work and how organized you are. I am also a physician, but I cut back to part-time with the birth of my second child. Despite being part-time, I still am exhausted and totally frazzled. I’m going to borrow you idea of scheduling special time with each of my kids. Wow, I am incredibly impressed! You make such a busy schedule sound smooth. My life isn’t this organized, but I can relate to the cheers for no more turning the palate extender–it felt like torturing my child. Hurrah to being done with that! I love everything about this. Thank you for sharing and showing that it’s possible for both parents to have very successful careers. Too often we, as women, feel we cannot be a good mom and rock it in our careers. That isn’t the case though. Similar to you, our au pair is such a lifesaver. She’s 100% the reason my husband and I can continue to work the way we do.